Slice of Life is hosted every Tuesday by the writing community at twowritingteachers.wordpress.com. 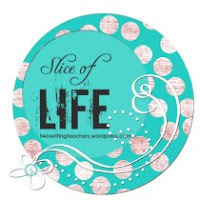 Stop by and join in with a post or a comment. All are welcome! We had a special visit from author Lynda Mullaly Hunt today at our school. I knew from the surprise visit that she paid to Melanie Swider, written by Melanie on this bog here, that I would like Lynda, but I was not prepared for how much I would learn from her presentation. For those of you who are not yet familiar with Lynda's book, One For the Murphys, I recommend moving it to one of the top spots on your summer reading list. She gave a wonderful presentation to both our sixth-graders and our fifth-graders. I missed the first part of the presentation, but was there enough to capture some highlights that I want to remember for my own writing life and share with the other writers in my world. Writers think of times when they have felt emotion and they use those times to weave that emotion into their stories. Lynda shared times in her life when she felt certain emotions and then pointed out places in One For the Murphys where she re-created that emotion. Try starting stories in the middle of the action, and not with a description. She showed an example of starting right in with what the problem would be. The length of the passage was much shorter, much more filled with nouns and verbs, and much more engaging for readers. Always think of ways that you can build tension for your characters. Writers always think about how they can create tension because that it what hooks readers. A great exercise is showing a picture of a situation and then talking about ways that we can build tension... SO many ways to do it! I can't wait to do this as an exercise with students! Choices that characters make reveal things about who the characters really are. As writers, how can we tweak actions and conversations to reveal aspects of character? Loved this as a concept. Lynda gave one of the most honest and inspiring presentations that I have ever seen from a writer, and the children were attentive and appreciative. If you ever have a chance to meet her or hear her speak, she is an incredibly special person. Don't miss that opportunity! Watching students take the Smarter Balanced Assessment, it was really apparent how important it is that students understand that there are three types of writing. Even though students participated in the same background building activity and read the same articles, they randomly received either a narrative, informational, or opinion/argument piece to write. Our sixth-graders experienced writing instruction integrated in all of their subjects this year. I received concerned feedback about this at the beginning of the year; students became confused when they had to switch gears from informational writing in science to argumentative writing in social studies, and then to literary responses in reading. However, I think that this sort of integration helped our students when they face a random selection of writing on their SBAC performance assessment. 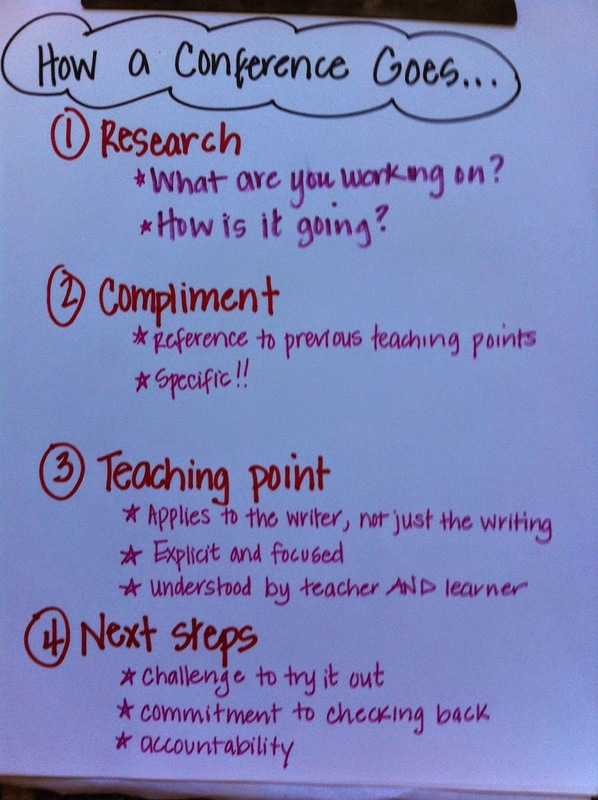 As a team, we developed anchor charts for the three types of writing that we shared with all of the teachers. The anchor charts that I am sharing in this post are from Peg Bruno's class, but a sample of each one is included in our district's curriculum and a derivative of them can be found in almost all of the district's 6th grade classrooms. We have even passed them up to the seventh grade teachers so that the language that students have already heard is there for their next teachers. One of my guiding beliefs about charts is that students should be involved in creating them. The duplicating of the charts from one sixth grade class to another is an exception to this belief because students have already been involved in the creation of the chart in one of the classes. To borrow one of my favorite lines from Kate Roberts, our TC Staff Developer, these teaching points are rinsed and repeated in various classes. These charts provide a scaffold and a structure for students to retain, transfer, and remain responsible for their learning throughout the year. As I am envisioning some of the revisions to the launching of some of our earlier grades' writing units, I am liking the idea of a lesson that teaches students that there are three types of writing. While I don't want to teach everything about each one, I think that developing their awareness of the different types of writing will help them learn the nuances of each type throughout the year. This awareness could also help them weave various types of writing within the curriculum throughout the year. I am picturing the development of a chart that contains bullets about each type of writing, done either as an inquiry lesson or as a presentation to students. If anyone has taught this lesson, I'd love to hear how it went and whether it helped students shift between various types of writing. Ultimately, the types of writing do not live in silos; strong writers use the three types purposefully and powerfully. My goal is to develop instructional strategies to help more and more students understand and appreciate how important words are in our lives. One of the hardest aspects of being an instructional coach or a curriculum coordinator is the distance that exists between us and the students. This is my second year as our district's writing and social studies coordinator, and I have worked harder this year at maintaining connections with students. Fortunately, my office is within one of the schools, and I now have several friends who visit me on a regular basis. One of my favorite visitors is Sanique, who come once a week to borrow books. I have several shelves of mentor texts that we have collected over the years, and I have supplemented Sanique's options with my daughters' collections that have been gathering dust in the shelves at home. She is an extremely conscientious borrower, leaving clues of her visits if I'm not there in the form of returned books on my table and messages about what she is checking out next or when she will back. My officemate thought that she had written that the books had bored her, but I knew exactly what she meant. Her note made my day. At a recent meeting with our kindergarten teachers, they asked for more books to support the Citizenship Unit that they teach. A few of the teachers gave me some book suggestions that we ordered and I have been enjoying reading them. 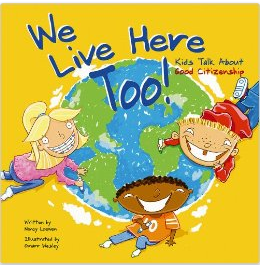 We Live Here Too by Nancy Loewen is a series of letters and answers about issues that involve citizenship. Presented as advice, this book is funny, but the messages are loud and clear, and many of the situations are spot, as to what kids are needing to learn about kindness, responsibility, honesty, and respect. 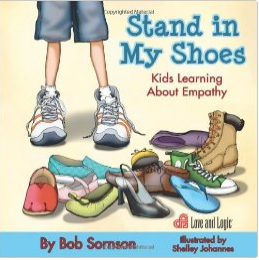 Stand in My Shoes by Bob Sornson is a wonderful story about a little girl who makes it her business to spend her day imagining how the people in her world are feeling. She shares an important realization at the end of the book, a realization that could inspire many children to be more empathetic to the people around them. Enjoy this one! 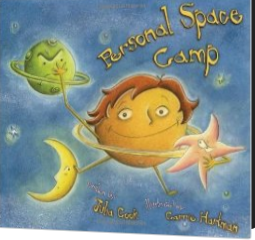 Personal Space Camp by Julia Cook is the hilarious story of a young boy who thinks that his invitation from his principal to learn about personal space has much more to do with Jupiter and Mars that with the boundaries that we maintain between people in our immediate vicinity. The book is full of metaphors and misunderstandings that will definitely inspire laughter. However, it will also inspire some common language about what we mean when we say personal space and why it is an important concept for children to learn. Teamwork Isn't My Thing and I Don't Like to Share by Julia Cook is another funny one. RJ has several experiences that many children will be able to relate to--being teamed up to work with another student who he doesn't like, having to deal with a nosepicker, being asked to share when he doesn't want to... However, the message comes across loud and clear that teamwork is much more effective that individual work in most aspects of life. 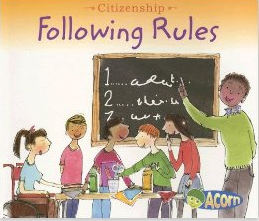 I think that Following Rules by Cassie Mayer can serve a dual purpose in a kindergarten classroom as a social studies book for citizenship units, and as a mentor text for information writing. The text is simple, but there are several text features that we are always on the lookout to show kids in order to use the features in their own writing. I can slide the columns up and down to see more and less recent tweets, but I can also adjust the order that my columns are in, which I've explained later in the post. From there, you can use your twitter id and password and then customize the screen to be the chats and hashtags that you want to follow. When there's a chat or hashtag that you want to follow, add that column and you see all of the activity about it right there in one place. 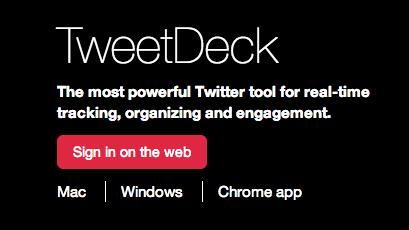 You can tweet right from tweetdeck, adding an image if you care to. Sometimes, when I am participating in a chat, I put the notifications column next to the chat, so that I can pay attention to the comments back to me. You can move the columns around by using the grey column on the far left, adjusting to have various ones side by side in what ever way helps you to pay attention to the incoming information. 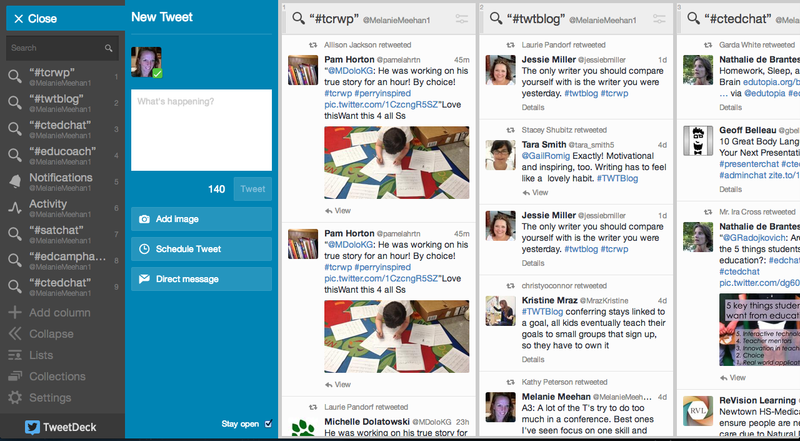 If you are already on twitter, I highly recommend tweetdeck--add a few columns with some favorite hashtags. Given the fact that you are reading this post, I recommend #tcrwp, #twtblog, #educoach, #engchat, and #elachat, but sky's the limit--there's no shortage of information out there. I was able to find some reading time during a really busy week. Even though I love May--it gets warm, the gardens are beautiful, the rain slows down--the annual pace of this month always stuns me. 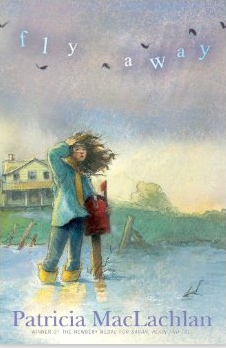 Fly Away by Patricia MacLachlan has been on my reading list since I heard she had published a new book. Patricia MacLachlan is my personal writing mentor. The combination of simple text, complex characters, gentle plots, and important messages that she creates humble me. Fly Away, at its core is about family and the importance of valuing each member for who they are and what they do. Lucy, the main character, is a poet, so the magic of poetry weaves through the text, but Patricia MacLachlan is magic when it comes to injecting snippets of character clues foreshadowing and this would be a great book to study either concept, since the text is simple and relatively short. I also have been meaning to read The Boy Who Harnessed the Wind by William Kamkwamba. This is a true story, and would be a great classroom book for narrative nonfiction, about a boy growing up in Malawi, wishing for clean water and enough food. His family's struggles with basic needs prevented him from attending school, and he tinkered with what most of us would label garbage. Eventually, he created a windmill that became an important energy source of hope for his village. In sixth grade, we study geography, human rights, and the evolution and impact of technology, and I will incorporate this book into our curriculum. It is an inspirational story about ingenuity, resourcefulness, and resilience, as well as a resource for our students to find ways to be impactful, global citizens. 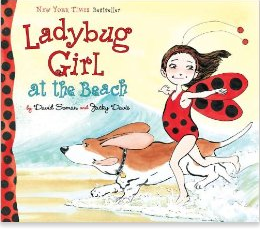 I have not previously read any Ladybug Girl books, but I picked up Ladybug Girl Goes to the Beach by David Soman. I have a demonstration story that I have written that I use when I am working with second and third graders on narrative writing that has to do with riding a wave, so I picked up this book at Barnes and Noble. David Soman has written this story better than I! Even though it is a dawn to dusk time frame--why can't we have more small moment mentor texts?? ?--there is great tension development and there is always the lingering question of what the story is really about. Even when Ladybug Girl is trying to distract herself with other activities at the beach, a close reader will realize that she really wants to overcome her fear of going into the ocean. Slice of Life is hosted by the writing community at twowritingteachers.wordpress.com. Everyone is welcome to join in and it is an incredible way to build camaraderie with other writers, teachers, learners, and thinkers. Across our district, our second-graders have been writing opinion pieces from the new unit from Teachers College Reading and Writing Project. Writing About Reading is one of the books within the new Units of Study that were published a year ago and I have loved watching the children experience this work. During the first two bends of the units, children learn to form opinions about various aspects of books--characters, pictures, titles, favorite parts, author messages... Initially, many of the pieces I read were book recommendations that went along the lines of "you should read this book because", but gradually I have seen our students move away from this sort of uninspired recommendation to meatier opinion statements. Yesterday, I was a guest in a class and the teacher and I had an impromptu debate as to whether Mercy Watson was a hero in Mercy Watson to the Rescue by Kate DiCamillo. I took the less popular stance of her being a hero, and the kids got right behind their teacher, finding evidence in the book to support the statement that Mercy was only after buttered toast and should get no credit at all for getting a rescue team to the Watson house to save her family when they fell through the bedroom floor. I had a second copy of the book and a few of the students came over to my side. Students were reading exact lines to and with me in order to prove their claim and one student even pointed out the look on Mercy Watson's face. During their independent work time, their teacher and I challenged them to use the phrase "for example, on page ___" and many of these second-grade students were spot on at citing evidence from the text of their independent books in order to prove their points. who was to blame for Brother Bear's bad grades in The Berenstain Bears' Report Card Trouble. whether Papa Bear was a good parent in The Berenstain Bears' Too Much TV. whether Poppleton was self-centered in Poppleton in Winter. whether Mercy Watson is greedy when she eats everyone's popcorn in Mercy Watson Something Wonky This Way Comes. who is smarter--Minnie or Moo in Minnie and Moo Go to the Moon. This unit has led students to think about reasons and go on a hunt for evidence to support those reasons with energy and purpose. I'll be posting more about it as we finish it up, but for now, I have to say that it has been great fun to authentically argue about books with second-graders. At first, they really can't believe that a teacher would say something so outrageous, and then they become entirely committed to proving me wrong, which is exactly what I want them to do. A few weeks ago, I presented an hour-long workshop to our district's elementary special education para-professionals. These are the people who work with our most struggling students, frequently in a one-to-one or small group setting. These people do intense and critically important work for our district, and, more importantly, for children. One of the greatest challenges of their work is building independence with a population that tends to be dependent. As a district, we assign one-to-one para support only when a student is so impaired that he/she needs constant support. Therefore, talking to them about ways to build independence with their students seems almost like an impossibility--a foray into an oxymoron. That being said, I have been in classrooms since this workshop, and I have tried to help some of the paras figure out ways that they can move away from students, but have those students continue to get some writing done. To have students, at any level, work successfully on their own, educators at all levels should understand the four components of an effective writing conference. The Teachers College Reading and Writing Project has an incredible collection of videos of instruction, including one of Jennifer Serravallo conferring with a fifth-grader about considering audience. While the skill may not be relevant for all elementary students, this short clip is a powerful example of the structure of a writing conference. During the research part of the conference, the student should be doing most of the talking. This is also an important time to remember that the teaching is about the student and not about the writing piece. If there are flaws in the writing piece (and there will be), we are not trying to make the piece better; we are trying to teach the student how to make this piece and future pieces better. 2. Compliment: Find something specific to tell the student that he/she is doing well. I have found it extra effective to do this step loudly enough so that other students working in the immediate vicinity hear it and are reminded by it. Really effective comments can incorporate some of the teaching points from recent workshops. "You are working so hard to use proper capitalization rules! Look at how you have capitalized....!" "Look at the amount of writing you have done! You really have worked on our lesson of keeping your pencil moving--wow!" "Love that you are trying out different beginnings in your writing!" If there's any step that is going to be forgotten by experienced conferrers, this is the one. However, especially as a guest teacher in the room, I can attest to the fact that the compliment is what makes the student malleable and receptive to the teaching point. When you watch the conference that Jennifer Serravallo gives in this video, you can watch the student absorb her compliment and become readier for her teaching. "I want to show you how writers stretch out words so that readers can read their pieces." "Let's take a bit of a challenge here. Sometimes writers slip in word for word quotes from books in order to make their points stronger." "When we write stories, sometimes writers slip in background information about characters within the action." Whatever you decide to teach should be clear to the student and will be most effective if there are opportunities to practice the skill, if it within the zone of proximal development for the students, and if there is some kind of system for accountability. 4. Next Steps: Speaking of accountability, this is folded into next steps. I love the line "I'll be back and I want to see the evidence of my great teaching." Students laugh at this one. "Moving forward in your writing, you have a new challenge--here's what it is..."
"I have a post-it and I'm writing down what you are working on so that you remember on this piece of writing and on future writing pieces, as well." For students at any level, this is the point where the conference ends, the student has responsibility as a learner, and the educator steps away from the student. So often, especially with struggling students, educators stay with them throughout independent writing time, believing that these students won't write without them there and teaching the students that they can't write without them there. I created a chart that could help remembering the steps of a conference and I could even see teaching students with it. It is important for students, as well as educators, to know their responsibilities in a conference. Conferring is a wonderful tool to use in order to build independent writers, and each step is so important to the end goal of stepping away from the student with a mutual understanding of purpose and intent.